Banking and asset management companies all have certain business outcomes that must be achieved, both on the micro and macro level. LSPS Financial Services Case Management Framework provides the solutions that are specifically oriented to achieving these outcomes. Whether the solution encompasses the entire client lifecycle, or simply a single component of it, LSPS' unique software is model-driven, driving each process to achieve the specified business outcomes, all the while adapting to unexpected disruptions. 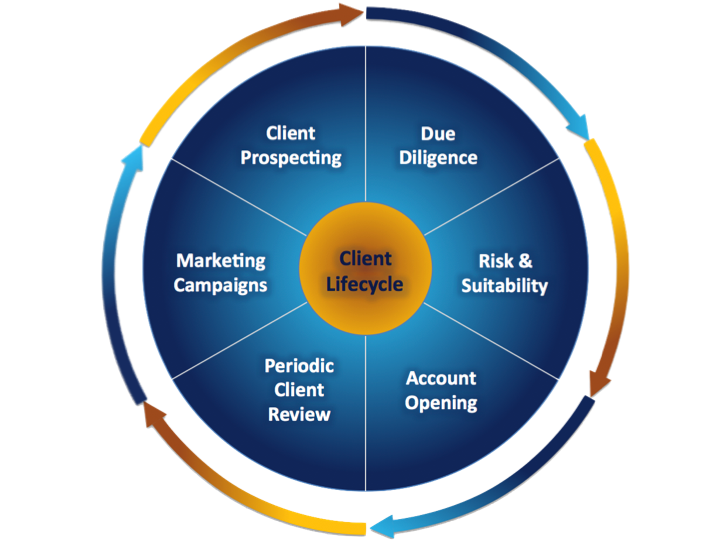 Client Lifecycle Management - CLM - ensures comprehensive and agile end-to-end client management. LSPS reduces inefficiencies and makes client onboarding a more streamlined, intelligent process. Form the core of a portfolio management system by modeling a comprehensive set of intelligent, goal-oriented processes. LSPS provides both the agility and transparency needed to comply with the oft changing regulatory environment. Automated credit processing for financial institutions. Simple and intuitive Web and Mobile applications providing banking clients with direct online access to their accounts, portfolios and performance reports. Reaching the right customers has never been easier. Credit & debit card disputes are traditionally a no-win situation. LSPS intelligent, goal-oriented solution changes the status quo. LSPS Client Lifecycle Management (CLM) is a standard framework for the end-to-end management of the client/customer lifecycle from a 360° perspective. From new client prospecting to account closure, the framework is configurable and customizable to the precise requirements of any financial organization. LSPS ensures that the processes and goals underlying the client lifecycle are intelligent, transparent, and agile, allowing financial institutions to provide unparalleled service with the utmost efficiency. Contemporary customers of financial institutions demand far more than in the past. Customers expect to be at the center of how their cash, investments, and loans are managed and rarely have qualms about switching providers. Financial institutions must ensure that their customer's experience is both efficient and effective. LSPS CLM focuses on the clients' expected outcomes and adapts process and application behavior to ensure personal goals are met and maintained, while maintaining consistency with organisational policy and regulatory requirements, even as they change over time. LSPS incorporates all components of Client Prospecting, including lead generation, identification, capture of basic information, and database checks. Initial contacts and meetings, legal and compliance checks, desk head confirmation, additional data entry, and travel approval requests are all processed and documented. Closing of this phase is also captured, from due diligence and account opening / client onboarding to reviewing existing prospects that are not converted into clients. All information is readily accessible by client advisors, operations, and compliance, as required, in real-time. Data is intelligently directed along appropriate process paths, based on preset criteria or exception requests, with each component documented. LSPS ensures there is full transparency and auditability. LSPS reduces the front and back office inefficiencies endemic to the account opening process, making client onboarding a more streamlined process for both the financial institution and the customer. Full details on Client Onboarding and Account Opening are viewable below. Documents client meetings and decisions in a call report. Customers are generally able to contact their financial service provider by a variety of means: in person visit, phone, written or fax order. Each requires its own means of verification and documentation that includes the client's instructions. This, in turn, requires multiple actions, ranging from verification of request to ensure proper authorization, submitting request, regulatory/legal requirements, and verification that the process has been completed. This relatively straight forward process, however, may frequently involve an exception. LSPS follows each request through the required exception components, ensuring that each step is documented and accomplished in the most expedient manner. LSPS provides multiple means to facilitate marketing campaigns that includes an Adaptive Case Management (ACM) approach to focus campaign activities, such as dynamic campaign structures that can adapt to business goals, the ability to have 'smart selection' of candidate groups, online marketing analytics, and an option for call center integration. For more details please see below. Whitestein's CLM is a comprehensive package; however, customers may choose which of the above processes they need to suit their own business model. Likewise, each process may be easily customized to specific customer needs. The first impression of the account opening process sets the tone of the relationship between the financial institution and the customer, paving the way for future business opportunities. LSPS makes this process as seamless as possible both on the front end for the customer and on the back end, for the bank. Data capture is often the start of delays and significant paperwork. Instead of requiring customers to fill out multiple paper forms, switching to digital forms saves the customer and the bank time and money. Easy implementation, and clear, updated task lists minimize delays and confusion for the customer and employees. Information required for client approval varies based on many factors, ranging from type of product to risk components to income levels. As these factors change, LSPS provides the ability to safely make updates and ad-hoc changes to running process instances, resulting in fast and efficient implementation to all relevant parties and documents regardless of whether this occurs within a single division or across the entire bank entity. Ongoing monitoring of status triggers alerts for those instances requiring additional action, including those in mid process. The result is a more seamless flow for both the employee and the potential client. LSPS identifies bottlenecks and escalates to the business owner, with suggestions of best alternative paths to resolve the issue. Once a new customer application has been approved, the process does not stop. From issuing welcome kits to providing ongoing communication, analytics can help determine how best to further serve and market to customers. Positive customer service results in the strongest marketing campaign in which any business can engage. Should the bank opt to codify customers' comments and questions to help both their experience and the bank's ability to further fine tune its processes to assist the customer, then LSPS allows business owners to include customer input into their process model. From initiating customer contact to managing portfolios, LSPS enables users to model a comprehensive set of intelligent, goal-oriented processes that form the core of a portfolio management system. Easily integrated with legacy systems, LSPS enhances existing solutions to meet customers' requirements in scope and scale, resulting in a flexible, integrated, and intuitive environment for both the bank and the customer. 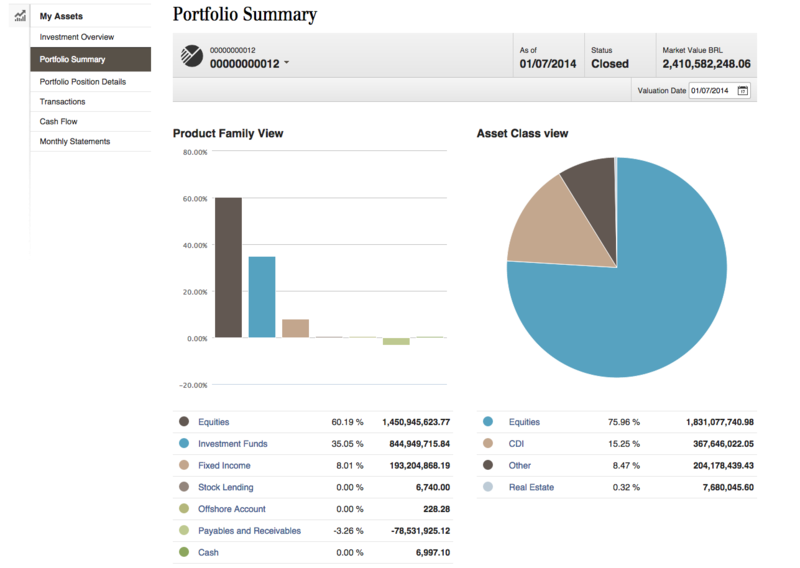 LSPS portfolio management provides all functionality necessary to define both strategic and tactical asset allocations for discretionary management. Model portfolios may even be individually managed per segment to follow an expert oriented multi-manager approach. 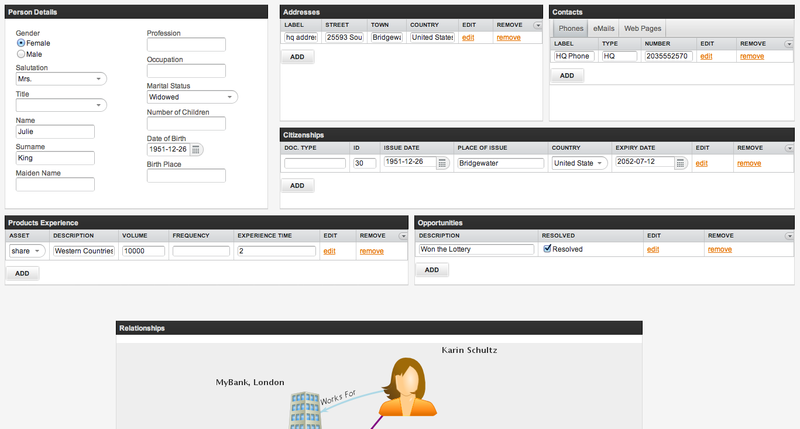 The automatically generated proposals can be adapted and used to create bulk orders. In today's environment, financial institutions must follow a myriad of evolving local and international regulations. Failure to fully implement these regulations can lead to a range of problems. 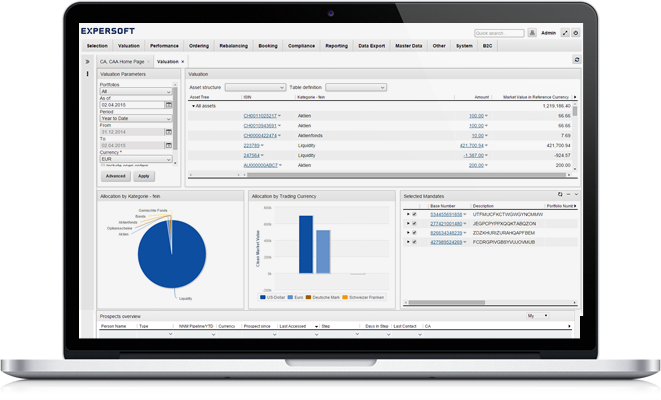 LSPS crosses business lines with the necessary functionality to both accommodate the multitude of regulations, such as MiFID II, FATCA, OECD-AEI, FinfraG, FIDLEG, PRIIPs, AIFMD, HKMA, and Dodd-Frank, and provide the agility to quickly adapt and comply with the evolving regulatory environment. In so doing, LSPS also provides the ever important transparency and auditability required in the financial services industry. LSPS streamlines the extraction and collection of relevant regulatory and compliance rules to be incorporated into new and existing processes. And because regulations must be implemented into a range of interactions, ranging from linear to complex, the intelligent core of LSPS is able to coordinate and analyze the full scope of the process interaction, autonomously inserting new components into workflows across the entire financial services landscape. Mortgage and loan applications have evolved into complex, paper-intensive processes that require the involvement and interaction of multiple stakeholders and systems. Small delays, missing data, exception cases can each have much larger impacts on both the institution and the customer. LSPS seamlessly guides employees through each process, intelligently adapting to changing needs, proactively taking steps to avoid delays to meet preset business goals in a reliable, fast, and friendly way. Mortgage and loan applications are sophisticated processes that demand the cooperation of multiple departments (Mortgage/Loan Dep., Underwriting Dep., Closing Dep., etc.) in order to be successfully completed. 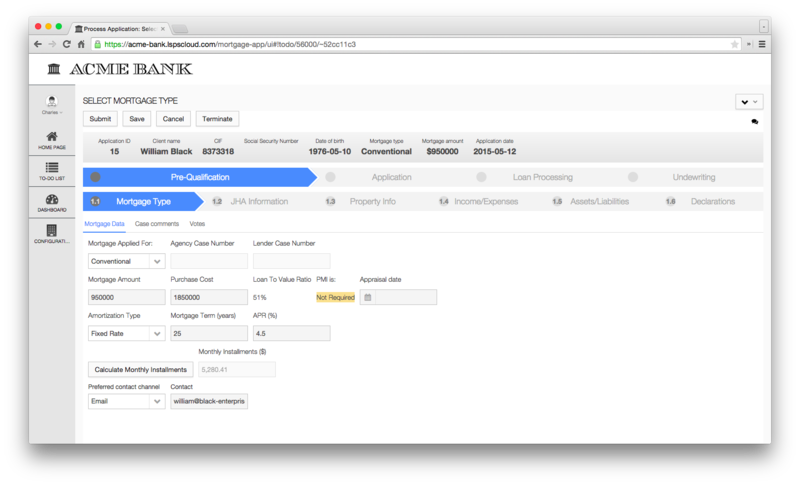 Using LSPS, all interactions are smoothly optimized, mediated, and monitored during every mortgage and loan stage ensuring the successful completion of required business outcomes. Full transparency ensures that business owners are able to see full status in real-time. This process allows Loan Officers to pre-qualify potential borrowers. Through the intuitive LSPS Dashboard, users can quickly process each task, while ensuring transparency for the team. This gives the team full knowledge of status, and thus the means to provide efficient customer service. Today’s world necessitates the rapid expansion of digitalized document exchange. If a loan has been successfully pre-qualified, LSPS allows for the synchronous (message exchange, integrated discussion board) and asynchronous (emails, sms, etc.) interaction and document exchange between the financial institution and the customer. LSPS makes it easy to integrate all the provided communication channels into the workflow of the business process. The last two stages of a mortgage/loan process include the interaction of the financial institutions’ employees for the approval decision. LSPS provides support for collective decisions by introducing voting protocols for any department, role or employee of a financial institution. In addition, this stage of the mortgage/loan application significantly benefits by the LSPS data export mechanisms. After reviewing and evaluating the application and associated documents, a set of documents and reports must be produced, regardless of the ultimate decision. LSPS automates this procedure and exports the necessary information in multiple electronic formats (doc, xls, PDF, XML, etc.). LSPS Digital Banking solutions are designed to provide banking clients with complete access to their financial data in a clean and intuitive dashboard approach. The solution is designed to be customizable to the needs of each financial services business, while preserving key features including minimal clicks and clean presentation of information. LSPS Campaign Management enables precise targeting of customers, to ensure the right people receive the right materials at the right time, while making sure that nobody is inundated with mailings irrelevant to their own circumstances. 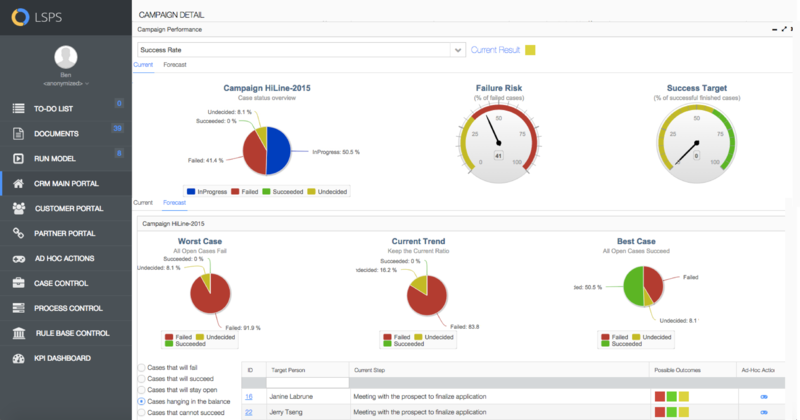 LSPS Campaign Management is a comprehensive tool that can be generally defined by three primary stages: Definition, Execution, and Assessment. Through this stage, users are able to create and manage campaigns. The target audience is easily determined by defining any number of search criteria to precisely tailor the list of recipients. Of course, Campaign Management is not simply identifying the audience. LSPS allows users to establish the basic attributes - Project description, Goals, Workflows, Timeframe, Budget, as well as Expected and Real Costs - that are necessary to successfully implement a campaign. And because there are often many people involved in various stages of a campaign, LSPS' change management tools are designed to facilitate communication, transparency, and consistency. Execution is the stage in which the workflows are processed. The intuitive, web-based dashboard makes it is easy to quickly view status, see potential and actual delays, modify individual cases, skip non-mandatory steps, or include pending items, if one-off situations occur. 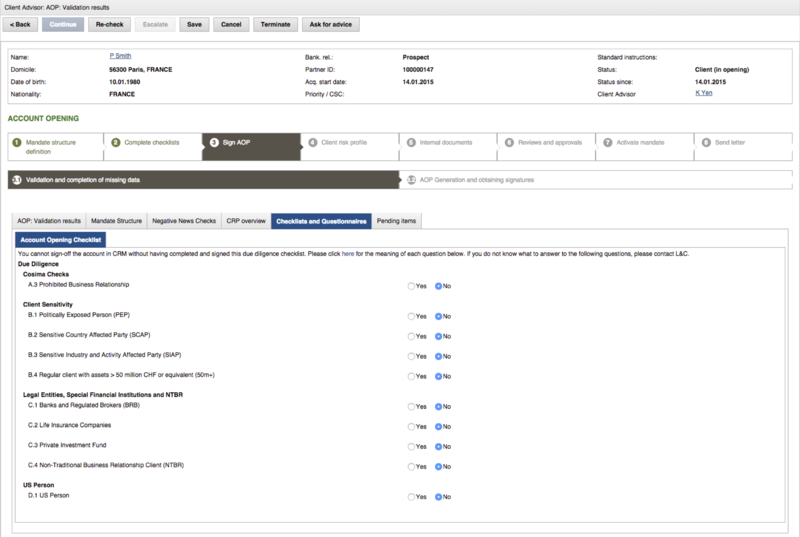 Not only does the Assessment stage provide for reporting and performance evaluation of completed campaigns, it also provides a real-time, adjustable view on executing campaigns. This includes a range of KPIs, such as Contact Rate and Success Factor, so that progress can be evaluated at any stage. Combined, these three general components provide a powerful and agile tool to manage campaigns, with the ability to easily assess success on multiple levels. Templets for concert actions within the scope of a campaign, which is organized into workflows that define the order and conditions of campaign actions. 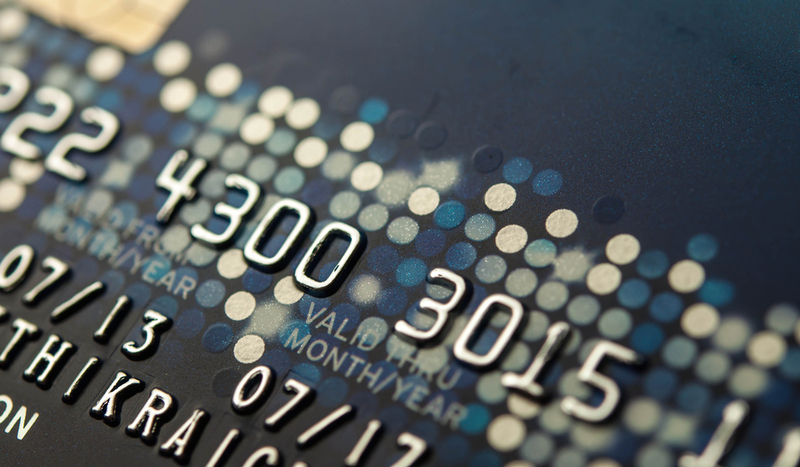 Credit and debit card disputes are traditionally a no-win situation that often results in disgruntled customers and inefficiencies that, for financial institutions, result in loss of time, money, and potentially customers. LSPS rectifies these problems by providing a comprehensive set of Web-based tools that encompass the entire timeline. From initiation to resolution, banks are able to provide their customers with answers and resolutions in a manner that makes the process as painless as possible for all parties involved. The results include more satisfied customers who, often with a single contact, are able to have their questions answered without the hassle of call transfers, call backs, and delays. Furthermore, because employees can easily see next steps, training time is reduced, and processing errors are minimized. The ability to easily incorporate compliance requirements from the beginning of the claim further streamlines the process, while making it auditable. Changes to the process may be quickly implemented in real-time and may be seamlessly integrated into an ongoing process, ensuring that claim processing time is impacted as minimally as possible. Satisfy compliance regulations, including Fair Credit Billing Act and Regulation Z.